From January until March, Vienna transforms the park around the Rathaus into a hugely elaborate ice skating rink. The paths and walkways typically occupied by people strolling around the town hall are made into winding ice paths through the trees. It’s beautiful and looks like it would be a ton of fun . . . if I knew how to skate. I’ve been a few times (mostly birthday parties in elementary and middle school) but I have neither particular skill nor talent for it. That’s unlikely to stop me, though, so going skating at the Rathaus has been on our “to do” list for weeks. First the weather got in the way — rainy and then bitterly cold — then we went to Innsbruck, and then Benjamin was sick all of last week, so we just hadn’t been able to go. We decided to try it this past weekend. Liam was sick, but Benjamin and I went with Pam and Joshua. It seemed like the kind of thing that would be fun for the boys, and a memorable experience for our guests to have while they are in Vienna. We got ourselves over there (no small feat with two preschoolers in tow) just in time for the rain to start. Undeterred, we rented skates for the boys, and discovered that we didn’t actually need any for ourselves. We’d decided to stick to the children’s/practice area off to the side, and it turns out we didn’t need to wear anything other than our regular shoes for that area. Benjamin and Joshua had their hearts set on wearing real skates, though, so we rented some for the boys. Benjamin loved it. At first, he was uncertain and wobbly, but he held on tight to my hands and I walked him around the ice. Joshua went around once and called it quits — but he had a great time running around. Benjamin and I went around and around. Mostly he held on to both of my hands as I walked backwards, but I walked alongside him, just holding one hand for parts, too. We acquired and tried a “practice penguin” — designed so that little kids can practice skating on their own — but B didn’t care for it. He preferred to go around with me, so that’s what we did. He really enjoyed himself. For one brief moment he let go entirely and did a second’s worth of skating by himself, and he also once demonstrated how a “ski jump” should go: he jumped right up in the air, both feet off the ice (about 1/4 of a inch off, but still) and landed, smiling. We didn’t last too long. As much fun as it was to skate, it wasn’t much fun to get rained on (although I am impressed by how undaunted the Viennese are by the rain — the place was almost as crowded when we left as when we arrived). We finished skating, had lunch with Pam & Joshua, and then headed home. We had a great time, and I can’t wait to take Liam and Dan along with us, the next time we go. 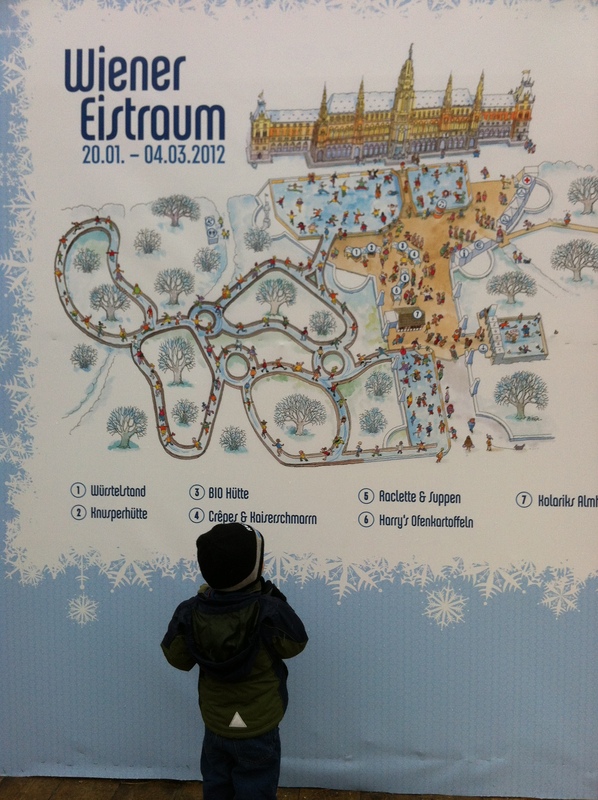 This entry was posted in Adventure in Vienna, Kids and Parenting and tagged skating by admin. Bookmark the permalink.